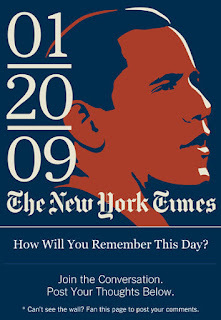 See the Front Pages from Newspapers all over the world today at: http://www.newseum.org/todaysfrontpages/default.asp. I hope that no matter what your political affiliations are, or wherever you reside, that you are able to enjoy the historic events of this day. This is truly a new chapter in American History unfolding before our very eyes. When patients thank us for what we do as nurses, it's really special. And when they take the time to do something unique it's very gratifying!! Pete Dowan is a disabled musician who writes and records his own music in his basement in St. Catharines, Ontario, Canada. He has spent a lot of time in hospitals and around nurses and he wrote a song to say thanks to the Ladies in White. Yes, he knows nursing is not about gender, but his nurses were all women and the all wore white....so go with it and be gracious for his gift and thanks!!! Give his music a listen on his MySpace page. (You don't have to register or log in.) You can purchase the music from iTunes or Amazon. There are links on his page or see http://petedowan.googlepages.com. Thanks Pete for taking the time to say thanks to your nurses!! The shortage of nurses will not diminish due to the current recession. In fact, career opportunities for nurses will continue to rise. For many who have been laid off or face layoffs in the near future, the prospect of becoming nurses is offering hope in an otherwise dismal economic future. This offers a shred of hope to the nursing workforce which is being challenged by growing shortages. Obstacles remain unchanged however. Nursing programs in most areas of the country are still impacted and long waiting lists will become longer. This does not have to be a barrier to hope for those looking for future stable employment opportunities nor to the stressed out corps of nurses currently working. However, applicants need to be aware of the stiff competition for nursing programs. Many nursing programs require some experience in the medical field for admission to nursing school. One of the ways to earn this experience and to find employment while waiting and then while attending nursing school is to become a CNA. Certified Nursing Assistant programs are available through vocational schools, community colleges and adult education programs. These programs are usually low cost and take about one semester to complete. While RN programs may be impacted, LPN programs (in Texas and California the term is LVN) may be open or at least have much shorter waiting lists. The Licensed Practical (Vocational) Nurse route can be a stepping stone to becoming and RN or it can be a lifelong career option. LPN programs typically take 12 to 18 months to complete. Then the candidate must pass the NCLEX-PN exam to become licensed. LPNs are often referred to as bedside care nurses, but their role and scope of practice in many states has expanded greatly over the last few years. With additional training, LPNs can become certified in some aspects of IV care, pharmacology or long term care. The scope of practice varies widely from one state to another. Information about the duties of the LPN/LVN is available from the Board of Practical (or Vocational) Nursing. See the National Council of State Boards of Nursing at http://NCSBN.org/515.htm. The LPN/LVN can advance their education and career by becoming an RN in a variety of ways. Online education programs are open to LPNs where as for non-nurses, a traditional brick and mortar school is required. You cannot learn to become a nurse without hands-on experience. This is a requirement for the nursing program to be accredited and for the student to be able to sit for the board exam and become licensed to practice. Non-nurses can become RNs by taking a program through a community or junior college and obtaining an ADN. Most hospital diploma courses have been disbanded. Non-nurses can also enroll in a BSN program at a college or university. RNs with an ADN can also advance their degree to a BSN or an MSN through a faster track at colleges or universities. To become an NP (Nurse Practitioner) you must now obtain an MSN with a focus on the area of practice such as pediatrics, oncology, women’s health, mental health or family practice. For RNs wishing to specialize in clinical practice areas, certification education and examinations are available through the professional organizations devoted to these fields. For individuals who already have a Bachelors or Masters degree, especially with a science emphasis, many schools now offer accelerated nursing degree programs which either provide a BSN or MSN. It is not necessary to become an LPN or to take an ADN program to become a nurse if you already have a college degree. However, this option is not prohibited, and if an accelerated program is not available or has a longer waiting list, this option may be preferred. Nursing programs MUST be accredited. Always check with your state board of nursing. 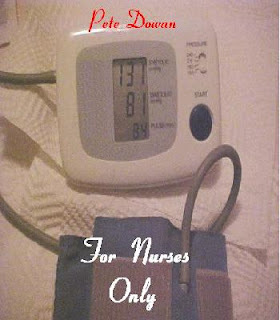 The Everything New Nurse Book also has information about how to become a nurse, how to find financial aid and how to survive nursing school as well as your first years as a nurse. It's available from Amazon.com. If you'd like a personalized signed copy, you can order one directly from me at kathyquan.com. In the January, 2009 issue of the American Journal of Nursing (AJN), Roxane Nelson BSN, RN poses the question of whether or not the idea of a National Nurse for America has stalled. When Teri Mills an NP and nurse educator from Portland OR originally proposed the idea in May of 2005, she suggested the creation of an office of a National Nurse in her op-ed piece in The New York Times. Over time the idea, as promoted by The National Nursing Network Organization (NNNO) chaired by Mills, has evolved to elevate and enhance the chief nurse officer who serves under the Surgeon General to the role of the National Nurse. This would utilize a position which already exists in the United States Public Health Service. The NNNO supports making it a full time position and to change the title to the "national nurse for prevention." Rep. Lois Capps (D-CA), herself an RN, introduced a bill (HR 4903 National Nurse Act of 2006) in the U.S. House of Representatives in 2006 to establish the Office of the National Nurse. The bill garnered 42 bipartisan supporters but was never passed. Citing primarily financial reasons, the American Nurses Association (ANA) along with several other prominent U.S. nursing organizations have refused to back the idea stating the office already exists and further funding to enhance and elevate this position would be better used to promote other needs for nurses. Mills and other founding members of the NNNO have argued that the benefits of elevating this role would far outweigh the costs of expanding this role. For instance, elevating the national nurse role to one of leadership in the task of patient education and disease prevention could help to reduce many of the skyrocketing costs of health care in this country. The staggering costs of chronic preventable diseases alone is bankrupting the system. Without cost containment, solving the health care and health insurance crisis in this degrading economy could prove to be impossible. This would be just one benefit of having a National Nurse. In addition, young people seeing a nurse in a primary leadership role in solving this health care crisis would have the benefit of recruiting many more young people into the nursing profession. As we are all well aware, the nursing shortage is continuing to worsen and will hit critical levels in the next decade. If we don't take strong measures to provide for more nurses in the future, we will all be affected by a lack of available health care. No amount of health insurance will make much difference if access is not available because of a critical shortage of nurses. Nurses understand how to prioritize, and it's essential now that we use our critical thinking skills and the nursing process to assess the situation, plan and advocate for the best possible scenario. We have a new President who will assume office in just a few days. He is very aware of the nursing shortage and the needs of nurses. He was endorsed by the ANA for this very reason. As a collective group we need to advocate for the change we need to help quickly solve the health care crisis this nation is facing. The economy won't recover until we heal the matters that are draining the resources of our citizens. Promoting healthy living and chronic disease prevention is a critical factor. Utilizing our nursing workforce to assist in this area is essential. To do so, we need the authority as well as national leadership. And as we stand tall and show our worth as nurses, we will gain the recognition we need to secure funding for education of new nurses and to address the quality of patient care for all. We have tried in vain for many years to be recognized for what we do as nurses, and our workforce and education funding has been cut year after year because we don't unite and have a real leader. The quality of patient care continues to be at risk because the working conditions for nurses has not been adequately addressed. The system is being flooded with patients who shouldn't need care if they had had some very basic education in the first place. We still hold up Florence Nightingale as our professional icon. Not to say this is all bad, but this is the 21st century and we are still looking to the 1800's for leadership. What's wrong with that picture? Another article in the January issue of AJN addresses this very issue as it's Top Nursing Story of 2008. Isn't it time to have a National Nurse and some true representation within the government? Find out more about the National Nurse campaign. Send your comments to AJN at ajnletters@wolterskluwer.com. Advocate for ALL of the changes we need to adequately address the health care crisis; not just a select few. As the economy tightens up, jobs in the nursing profession are becoming more and more sought after. One nursing specialty that continues to grow as the years pass, however, is geriatric nursing. Also referred to as eldercare, geriatric nursing refers to the care of elderly people who need assistance in a variety of ways. The United States’ population grew exponentially from the 1940’s to the 1960’s; this generation, known as the Baby Boomer generation, is now starting to age and many people that fall into this age group are in need of care. Naturally, as the years progress, more and more people from this generation will need assistance. According to the Bureau of Labor Statistics, the need for nurses specializing in geriatric care will increase by 20% between 2006 and 2016, far exceeding the need for nurses in other areas of expertise. This figure is an estimate, and more nurses may in fact be needed in the years to come. There are a wide variety of factors contributing to this large increase in demand for eldercare, including patients with terminal illnesses such as cancer, as well as Alzheimer’s and many other ailments that are manageable with proper care and assistance. Advances in medicine have certainly helped to extend the longevity of people’s lives and this means that more assistance will be needed to help these people live out their days comfortably and healthily, to whatever degree possible. There are many different places that will be in need of eldercare in the years to come. Naturally, hospitals will need more nurses who specialize in geriatric care. Hospices for terminal patients are another place where assistance will certainly be required. In addition to these, nursing homes for elderly patients are another market in which nurses will be in high demand. Assisted living communities are sprouting up all over the US as well, where a dedicated staff is kept on-hand strictly for the people who live in the community. Of course, for many years, home health care has been growing in popularity—especially for patients who wish to live in their home for the duration of their lives. Work environments and working conditions will vary in these different locations, but one thing remains the same: the Baby Boomer generation is aging and will need the proper care to live the rest of their days with the care they need and deserve. Kaplan Publishing, the publisher of a broad range of educational and consumer books by and for nurses, physicians, paramedics, and other healthcare workers, is now accepting stories for a new and exciting anthology, To The Rescue: Stories from Healthcare Workers at the Scene of Disaster. Devastating fires, hurricanes, earthquakes, and other natural disasters are ongoing concerns in every part of the world. The personal stories of people who go to the scene and interact with survivors will be of great interest to both the world community and to people who work in these fields. To The Rescue: Stories from Healthcare Workers at the Scene of Disaster is an anthology of stories by healthcare workers, from a variety of specialties, who have gone to the scenes of disasters, whether in their hometowns or across the world. Kaplan wants to tell your story. If you are a nurse, physician, paramedic, or other healthcare professional, please share your unique experience of working during a flood, a fire, a hurricane, a tsunami, a mudslide, a famine, an earthquake, or a conflict, and what it was like to interact with those directly affected by these disaster events. Tell us how disaster response/relief work has helped to shape you into the person that you are today. Your story shouldn’t be a medical report—make us laugh, make us cry; allow your words to open the doors to your experiences for the reader. All stories must be true and previously unpublished stories from your personal experience. Exceptions for previously published stories may be made if you retain the copyright. The tone of your story should be inspiring, poignant and, when appropriate, humorous. Submit stories in Microsoft Word, 12-point Times New Roman, double-spaced with a story title and word count. Tell a story that has a beginning, middle, and end. Write from your heart about a life-changing or life-defining experience. Authors may submit multiple stories. Cite the story title in the subject line. You can type the story into the body of the email or send an attachment in Microsoft Word as outlined above. Only one submission per email. You can send more than one story per envelope. Include one self-addressed, postage-paid envelope for each submission. Send only a paper copy of the story; do not send computer disks or CDs. We cannot accept any phone calls. Due to the volume of submissions we receive, we cannot acknowledge receipt of submissions or provide status updates. You will be notified by e-mail if your story is selected for publication. Manuscripts will not be returned.